Raphael, the turtle with the ‘tude, gets the special I Speak Comics treatment today. We’ll be looking at the furious hero’s Out of the Shadows trailer in an attempt to dissect his playstyle and see what makes him tick. Hopefully we won’t be getting a sai in the eye for our trouble. As I stated in the previous Donatello breakdown, take everything you see and read here with a HUGE grain of salt. Biggest one you can find. This is based on what? Pre-alpha footage? Everything here is subject to change. But let’s get started shall we? Check out the trailer below! Unlike Donnie, who can use his bo staff to lay the smack down from a distance, Raphael is an in your face sort of guy, someone who likes to get up close and personal while shelling out the pain. In TMNT: Out of the Shadows, the turtles’ resident bad boy appears to be the token grappler, with a host of throws ready to send foes into a whole new galaxy of pain. Add in some brutal knees, elbows, and sais and you’ve got one mutant you do not want to mess with. What intrigues me most here is the sheer number of different throws Raphael has at his disposal. Let’s dig into this video, the first throw we see is an awesome looking izuna drop (:15). Next up is what looks like a modified, extra brutal Osoto Gari (:19). Did I mention he has a power bomb too? Check out 21 seconds in. Oh and Raph has no problem grabbing a leg and straight up giant swinging a baddie into next Tuesday (:25)! Also if you look at a few other videos, namely the IGN breakdown video, you can see him doing a suplex of sorts at 2:26 into a ground pound. It even looks like you can combo into these throws, as you can see at :29 in the Raph trailer. He also has a throw, possibly a special move/contextual where he face slams a duo of punks into the pavement (:47). 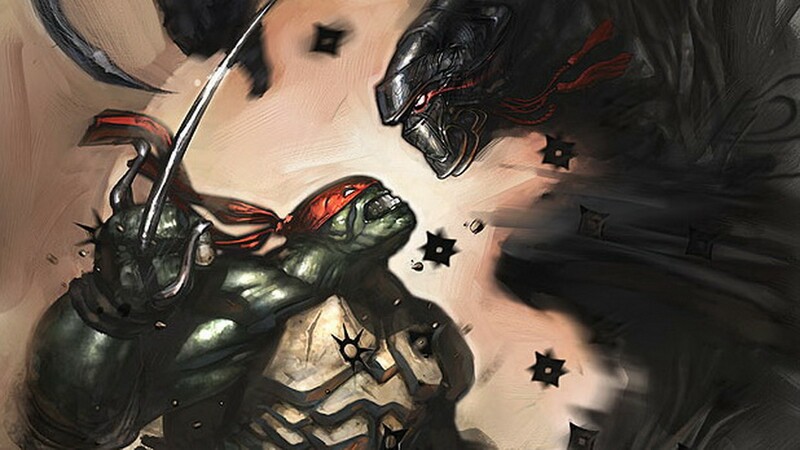 Finally, like Donnie’s parry/counter, Raph has one too. However, instead parrying and landing a single strike, Raphael counters and tosses his opponent away (:45). I like we’re seeing a different flavor of counter for each character. Just adds to the awesome. Now that we know he has all these awesome throws, the question becomes, are they safe? So many of these have a ton of startup and the animations, while super cool, take forever to complete. Can enemies knock Raphael out of his throws? Because if so, using them will be incredibly dangerous unless you’re finishing off a lone enemy. Raph’s fighting style looks heavily influenced by Muai Thai forms. The attack he does right after that first izuna drop at 15 seconds is a picture perfect copy of Sagat’s focus attack in Street Fighter 4. Maybe a little Brian fromAll you need to do is look at all those huge elbows and knees he’s dropping on fools to know Raph’s watched more than a couple of Tony Ja’s flicks. If we were going to compare these big knees to Batman, I have a feeling that they’re momentum based. The more you whomp on guys without getting hit and keeping your combo going, the easier it is to put down bad guys with one hit. At the beginning of the video we see Raph send himself careening into foes, sais out (:11). You can bet this is a shout out to Tournament Fighters. It looks great for tagging folks and closing the distance quickly, but there is some start up on the attack so you don’t want to just throw this out while surrounded in a brawl. Also this video gives us the first real example of a turtle using the environment to attack. At 38 seconds Raph wall runs on a big ol’ truck trailer, leaps off and sais a dude in the face. He looks like he actually throws his weapons too, which is a little odd? Finally, remember how we were messing around and broke down Donnie’s stats relative to the rest of turtles in power, range, mobility, and speed? Well if we do that for Raph, purely based on what we see here in the videos he might be – Power: 3, Range: 1, Mobility: 2, Speed: 3. You know now that I think about it, it might be better to do a 5 point scale, just so that Leo can be a 3 in ever category… Ah well. I think Raph is going to be a lot of fun to play as and brings some interesting things to the table. His throws look devastating, all his moves are brutal; he definitely appears to be channeling his rage into people’s faces. If you guys dug this little bit snippet of turtle soup, I’m going to be putting up a Mikey breakdown in the very near future, so keep your eyes peeled!